Retaining Wall Installers Near You! Whether your in need of a brand new landscaping retaining wall or only need landscaping retaining wall repairs, RC Fences and Decks is the company to call. We have been retaining wall installers since the company first originated Jan. 2017. We can build or repair all types of retaining walls. Whether it be a budget minded 2×12″ pressure treated wall or locking block wall, we can build it all. A retaining wall can have many functions. In its most basic form a retaining wall is a structure made of wood, concrete, blocks, bricks, etc. whose function is to retain soils or other materials where the height of those materials is greater on one side than the other! In residential use landscaping retaining walls are more often used to transform sloping or hilly properties creating beautiful usable space. If you have a large slope in your property and you want a flat area for grass or for the children to be able to play on, your best bet is installing a retaining wall! They help maintain hillsides, and create gardens, allow for basements and more often than not make a beautiful addition to your home. Because they often must bear a heavy load, a retaining wall’s proper construction is very important. Oftentimes we see landscaping retaining walls which are failing because of improper or no drainage at all behind them. In addition to drainage problems stone walls built improperly and wood retaining walls whose piers do not go deep enough usually well start to lean and eventually collapse. We Ensure a Retaining Wall That Will Last For Years to Come! 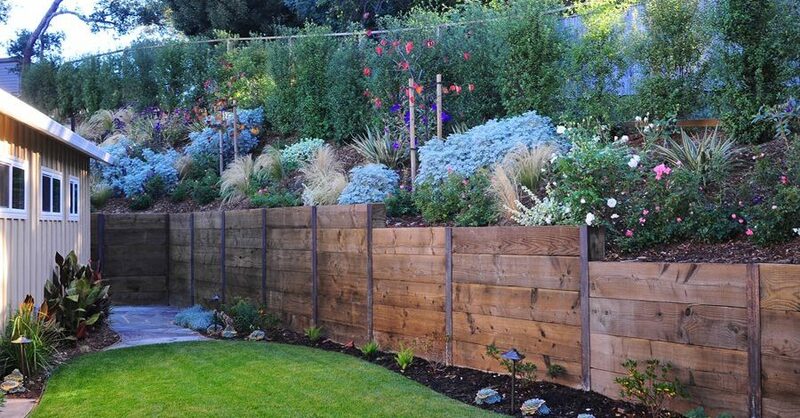 Whether you need a simple 2′ tall wall in your backyard to create a flowering bed or the landscaping retaining wall you need is massive, RC Fences and Decks takes into account the load, needed drainage and all other challenges your project may present in order to ensure your retaining wall will stand for years to come! We build retaining walls from a variety of materials so you can complement your home and garden. For a free estimate on building a retaining wall contact RC Fences and Decks. One of our team members will come to your property, discuss your plans and provide a thorough estimate of the job. In addition to retaining walls, we also build redwood fences, redwood decks, composite decks, gates, patio covers and a variety of other outdoor projects.